Everyone wants the government to cut spending unless it effects them. The GSA should be able to set rates so that government employees are in line with everyone else without grandstanding politicians making a fuss about over spending. A battle is brewing over the price that federal employees pay to stay at U.S. hotels. It pits one of the nation’s biggest hotel customers — the government — against a major industry, tourism. The outcome will undoubtedly affect Central Florida, the second-largest U.S. hotel market. 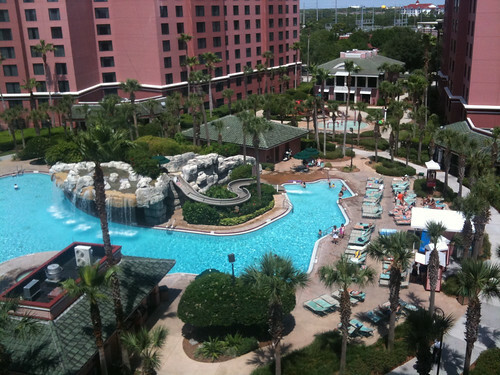 Pool at the Caribe Royale in Orlando. Photo by Sam Pullara. At issue: the federal “per diem” rate the U.S. government will pay for its employees to stay in a hotel room each night when they travel. The travel industry says that, following a scandal earlier this year over lavish spending at a government convention in Las Vegas, it has gotten wind of a proposal that could cut the per-diem rate by more than 30 percent in major travel markets. Just the possibility of such a change has trade groups such as the American Hotel & Lodging Association calling on members to rally against any reduction, and it has some hoteliers on edge in Orlando. At about $100 a night, the government’s existing room rate in the Orlando market is already too low to entice luxury convention hotels such as the Peabody or the Gaylord Palms. But cutting the rate further would likely cause other, more modestly priced hotels to reject government business, too. Travel groups say it is not yet clear how the U.S. General Services Administration, which sets the prices the government will pay for nearly all domestic hotel rooms, might tweak the formula it uses to determine its per-diem rates. The American Hotel & Lodging Association says the current method already puts the government 5 percent to 15 percent below actual market rates; reducing the rate further, the group says, would hurt hotels and would prevent government employees from finding adequate lodging close to their destinations. “It will essentially price the government under the market, where our hotels cannot cater to the government as they are now,” said Shawn McBurney, the association’s senior vice president of governmental affairs. The General Services Administration confirmed earlier this month that it is reviewing its rates for the 2013 fiscal year, which starts Oct. 1. The agency said it has not yet made a decision but will follow a recent White House directive designed to cut the government’s travel expenses. That memo, issued by the Office of Management and Budget in May, orders federal agencies to cut certain travel expenditures 30 percent in fiscal 2013, compared with 2010 levels. It also orders the GSA to use the government’s substantial buying power to reduce the prices it pays for hotel rooms and rental cars. In Orlando, where the hospitality industry employs more than 50,000 people, a core group of hotel chains consistently offers the per-diem rate to government meeting planners, said Rob Coffman, president of the Society for Government Meeting Professionals. One of them is Rosen Hotels & Resorts, which is going to host the society’s 2013 conference; it declined to comment on the possibility of a change in the GSA’s per-diem rate. Coffman said planners working on particularly large government meetings already find it difficult to secure rooms in Orlando, especially during the peak meeting season of February to April. A further reduction in the GSA rate could “force the cancellation of many government meetings, which would have a further negative impact on the overall economy,” he predicted. Locally, any cutbacks might have the biggest effect on hotels in east Orange County, near the University of Central Florida, where a cluster of training-simulation businesses and military agencies, most based in Central Florida Research Park, draw large numbers of travelers, Smith said. In addition to federal employees, workers with the many companies that contract with government agencies often ask for the federal per-diem rate when they travel. Government travel made headlines earlier this year when it was disclosed that the General Services Administration spent $823,000 on a lavish Las Vegas convention. That scandal once again put federal travel costs in the spotlight, amid a presidential-election year, a stalled economy and gridlock in Congress over government spending. “It’s in the industry’s best interest to act now,” said Erik Hansen, director of domestic policy for U.S. Travel. For some hotels, reduced rates would not be a negative. Other hotels are on the fence. At the Sheraton Orlando Downtown, the nearby federal courthouse provides a stream of government travelers. General Manager Jeff Brinda said he would probably continue to accept a lower per-diem rate during the hotel’s slower, summer months, but he might shy away from such less-than-lucrative business during peak periods.